﻿Welcome to the Kerfeld Lab Website! We are a research﻿ gro﻿up focusing on bacterial microcompartments, carbon fixation, and cyanobacterial photoprotection mechanisms. We are located in East Lansing, Michigan and Berkeley, Californ﻿ia. Our paper about the X-ray footprinting of OCP and FRP is out! Anna Stapelfeldt joined the Kerfeld Lab West as a Research Associate! The structure of our recent synthetic BMC is out as "just accepted"! Our review about applications of the orange carotenoid protein in synthetic biology is out! Our paper about characterizing the HCP2 of Fremyella is out! Our paper describing the high resolution Cryo-EM structure of the Haliangium ochraceum BMC shell is out! Our review about GRM microcompartments is out! Our image was chosen for the cover of this month's Plant Physiology! Our work about the unique CcmK3/CcmK4 proteins in carboxysomes is out! We published our method of assembling bacterial microcompartments completely in vitro! Check out the MSU-PRL article about this paper here! John Steele joined the Kerfeld Lab West as a postdoctoral researcher! Our new paper about engineering the Haliangium ochraceum BMC shell is out in Nature Communications! Tina was awarded with the prestigious Marie Curie fellowship! The fellowship will provide up to $300,000 over 3 years for her project that focuses on cyanobacterial photoprotection. ​Han won the 2018 Anton Lang Memorial Research Excellence Award! The Anton Lang Memorial Fund was established in honor of the founding director of the MSU Plant Research Laboratory, who passed away in 1996. The award recognizes a graduate student and a postdoctoral research associate who exemplify the research excellence, ideas, dedication, and vision of Anton Lang. Take a look at the article on the PRL website! Congratulations to Nancy who got accepted into a masters program in Microbiology at Loyola University in Chicago where she will start in the fall of this year! We are sorry to see her go and wish her all the best for her future studies. Congratulations to Aiko who was awarded with a NSF Graduate Research Fellowship! Check out this article on the PRL website for more details! Aiko also got mentioned on Natsci's story and MSU today. Clem is featured in a blog post published by Nature Reviews in Microbiology! Tina Dominguez has been selected to be the GRS chair for the Photosensory receptors and signal transductions meeting in 2020 in Hong Kong! Our Bacterial Microcompartment review is out in Nature Reviews ! ​this time at the Marconi conference center in Point Reyes. Alex Witte joined the lab as a research technician and Matt Melnicki has rejoined the the group! Many thanks to our undergraduate Ana for all her work in the Kerfeld lab over the last two years and congratulations for being accepted into the Wayne State University's Doctor of Pharmacy program where she will be starting in in the Fall 2018 semester. Good luck for your future studies! Lauren Achtemeier joined the Kerfeld Lab East as a Research Associate! Our paper about a new BMC-associated Flavodoxin is out! Our new review about carboxysomes just came out! β-Carboxysome bioinformatics: identification and evolution of new bacterial microcompartment protein gene classes and core locus constraints. ​Our new publication in Philosophical Transactions of the Royal Society B is out! Han wins a poster award at the 2017 Photosynthesis Gordon Research Conference! Our work characterizing new family members of the OCP is out in Nature Plants! Our complete HO shell structure is out in today's issue of Science! Our paper about the CTD-NTD interaction of the orange carotenoid protein (OCP) is out! 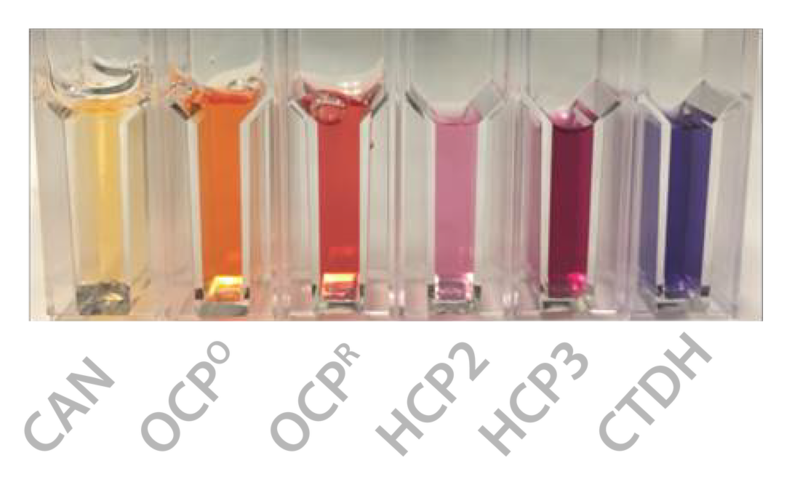 Synthetic OCP Heterodimers are Photoactive and Recapitulate the Fusion of Two Primitive Carotenoproteins in the Evolution of Cyanobacterial Photoprotection. Lechno-Yossef S, Melnicki MR, Bao H, Montgomery BL, Kerfeld CA. Kerfeld Lab members at the Plant Research Laboratory Department's Gutter Ball XXIII event. Clem won the 2017 Anton Lang Memorial Research Excellence Award! The Anton Lang Memorial Fund was established in honor of the founding director of the Plant Research Laboratory, who passed away in 1996. The award recognizes a graduate student and a postdoctoral research associate who exemplify the research excellence, ideas, dedication, and vision of Anton Lang. For more detail, check out this article: 2017 Anton Lang Memorial Award Winners Announced! Our paper about a bioinformatic analysis of CcmK type proteins in cyanobacteria is out! Congratulations to our undergraduate Cassie Dutcher! Cassie received first place poster award for the Biochemistry and Molecular Biology section of the MSU 19th annual University Undergraduate Research and Art Forum. ​Check out her interview about her experience with the department here! Congratulations to our undergraduates, Ana Belza, Cassie Dutcher and Sean McGuire, for doing a great job presenting at MSU's 2017 UURAF! Our paper about the different homologs of OCP is out! Congratulations to Aiko to be accepted into grad school at MSU! Bryan Ferlez joined Kerfeld Lab East as a postdoctoral researcher! Our newest review on OCP (Orange Carotenoid Protein) is out in Nature Plants! Congratulations to our undergraduate Sean McGuire! Check out his interview at PRL department here! Sean with his mentor, Dr. Aussignargues. Our News and Views on modularity/synthetic biology is out in Nature Biotechnology: Rewiring Escherichia coli for carbon-dioxide fixation. Tina Dominguez Martin joined Kerfeld Lab East as a postdoctoral researcher! Nancy Sloan joined the Kerfeld Lab West as a Research Associate! Our new paper with structures and phylogenetics of carotenoid binding proteins is out! Take a look at the news-brief from MSU about the article here! Aiko won a poster prize at the 12th Workshop on Cyanobacteria at ASU in Tempe AZ! ​Check out the MSU award recipients interview article here! Congratulations to our undergraduates Ana Belza and Tyler Shubitowski! Ana has been recognized by the Student Employee of the Year 2016 Program through the MSU Student Affairs and Services Department. Tyler is a recipient of the 2016 Physiology Undergraduate Research Award through the MSU Department of Physiology. ​Left​ Photo: Ana with her mentor, Dr. Gaudana. Our review about the current knowledge of cyanobacterial carboxsyomes is out! Our new paper about BMCs as metabolic modules is out! Han Bao joined the lab as a postdoctoral researcher! 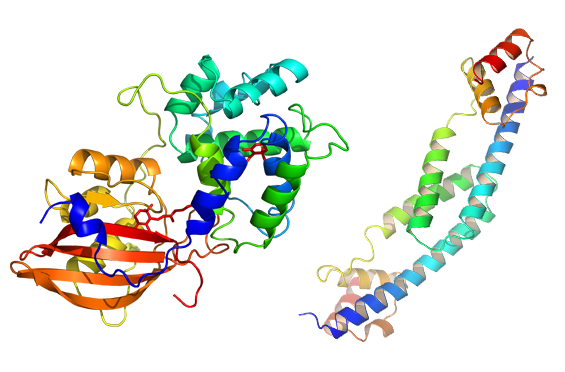 Our paper on the PduL structure / cofactor recycling in BMCs is out in PLOS Biology! A new paper about RuBisCO from our group is out! Our new paper about making synthetic carboxysome shells is out! New paper out just before Christmas! The invited essay on our work was published! Our new paper using high-speed AFM on microcompartment protein layers is out! Our new paper about the AAA+ ATPase CbbQ in H. neapolitanus carboxysomes is out! ﻿﻿We have a new paper about nanotubes from Mycobacterial shell proteins! Our new bioinformatics paper on GRE BMCs is out! New insights on OCP photoactivation in our recent PNAS paper! Our new paper on carboxysome engineering is out! Cecilia Blikstad joined the lab as a postdoctoral researcher! Rodney Burton joined the lab as a postdoctoral researcher! We have a new paper published in Science! Our new paper about encapsulation peptides in BMCs is online! ﻿Aparajita Banerjee and Jeff Plegaria joined the lab as postdoctoral researchers! Onur is now Dr. Onur! Congrat﻿ulations to Onur Erbilgin for earning his Ph.D. from U.C. Berkeley. Andrew Hagen and Manuel Sommer joined the lab as postdoctoral researchers! Fei Cai and Markus Sutter were featured in a "Meet the authors" special! Our new paper about CsoS2 is online! East meets West at the Kerfeld lab retreat in Monterey, CA. Sarah Newnham and Matt Melnicki are joining the lab as postdoctoral researchers! Our new review on Bacterial Microcompartments just got published! A new paper from our lab just came out! Our new paper describing a phylogenetic and functional taxonomy of bacterial microcompartments is out! Aiko Turmo joined the lab as a Research Associate! Lassila et al is on the cover of JMB!